There's a lot of mystery, especially for those English speakers that live outside of Mexico, surrounding the death, life and career of Villano II. He's seen by many as the unknown Villano. There's not a lot information of him around, but that's even in the Mexican media. This profile, is going to try to solvent that to a minor extent. Jose Díaz, better known as Ray Mendoza, got married to Lupita Mendoza and they had a big family. Their children were José de Jesús (Villano I), José Alfredo (Villano II, affectively known by close friends as "Pepe"), Arturo (Villano III), Rita Marina, Leonor, Villano V, Lupita and Villano IV, in that order. Wishing to be pro wrestlers like his father, the two older brothers started training with him and Bobby Bonales, who actually did the workload since Ray was wrestling a full schedule. Both had a solid base behind to start training as both were accomplished amateurs, especially José Alfredo who always was involved in local tournaments and won several, one of them on July of 1962 defeating none other than Adolfo Bolanes Jr. in the finals. As a funny thing, that same day Arturo, or may I say Arturito, won the under 27 kilos (60 pounds) tournament by defeating a kid called Alfonso Moreno in the final match. José had his first rivalry against, of all people, Chavo Guerrero, son of none other than the great Gory Guerrero. Both wrestlers were very green and in the first stage of their careers, but it was an interesting feud in the minor circuits because their fathers had been rivals at Arena Mexico. 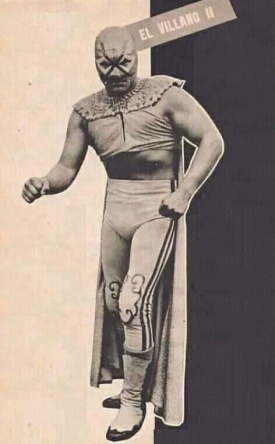 The future Villano II and his older brother went through several names, including Las Bestias Negras and Los Bufalos Salvajes, until under advice of Jorge Allende and the original Fantasma de la Quebrada (not the AAA one) they changed to Los Villanos. The Villanos started making some noise at the arenas in Mexico State, outside Mexico City, especially Naucalpan which was considered to be their home base. They got their seasoning and eventually worked for EMLL, mostly at Arena Coliseo. Since by late 1974 the power heads in EMLL changed and Ray Mendoza was not too happy about that, the whole Mendoza-Villano family (at that point just Ray and the first three Villanos) left and moved onto the brand new UWA promotion where due to political reasons they all got a push to several degrees, though in all honestly they deserved and were more than ready for it and in fact they didn't deceive anyone. But the career of Villano II seemingly went unnoticed, as he disappeared without much of a reasoning ever being given, though actually it was due to some legal problem. He wrestled some here and there, when he had a chance, but died a very mysterious death on April 17, 1989. I believe the "official" cause of his death was the Solitario thing of dying because of his wrestling injuries, though he had actually fallen on a terrible depression and hung himself in his house in Naucalpan because of that. The death of José Alfonso left a very sad mark in the family, and we can see that looking at details like Villano I never being the same worker again (not to say he ever was bad, in fact he was always great) and even though he was involved full time with the UWA promotion and was training tons, and I mean tons, of young wrestlers in the Ham Lee gym, there was talk that he was there only out of loyalty. And every time Villano III is having an interview and the subject of his deceased brother (or now brothers) pops up, he loses his voice and starts visibly crying. Villano II was a very good worker, as one may expect coming from that family. It is hard to rate the five brothers among themselves, because even though it's almost universally agreed that Villano III was in his good years the best worker and biggest star, all of them are so similar in style. But many times I have talked to people familiar with all five brothers and they have agreed with me that he was right in the middle of a brothers ranking. Though in all reality, as said before names are interchangeable because style and size is basically the same. To end this sad note with a funny curiosity, in his free time Villano II was a talented freelance artist. This page was last edited on 15 February 2019, at 00:38.